Our beloved organization AIIEA will be completing 62 years of its purposeful existence and entering the 63rd year of its onward march on 1st July 2013. 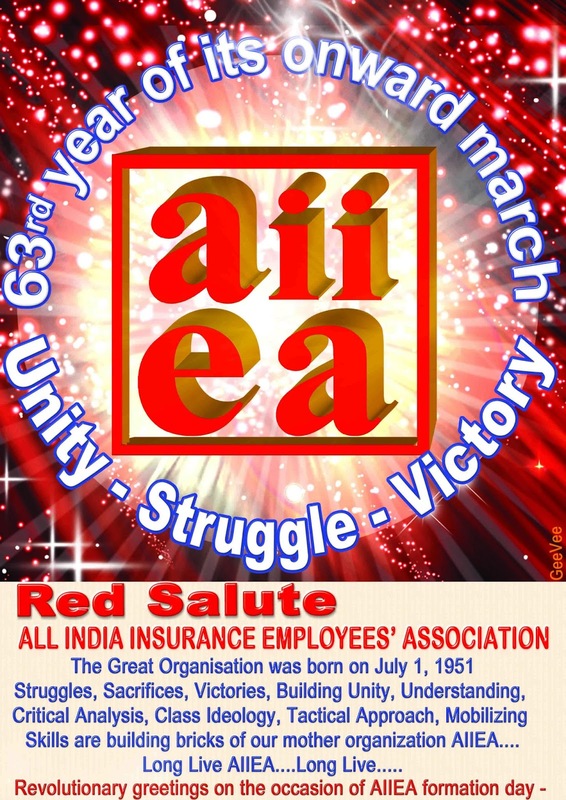 Insurance employees organized under the banner of AIIEA will be celebrating the formation day of AIIEA with lot of enthusiasm and joy across the country. On this wonderful occasion, we extend our warm and revolutionary greetings to all the employees and their family members. 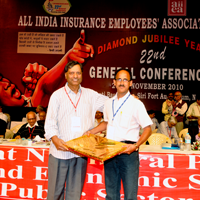 Since formation, AIIEA has been playing a pivotal role in not only protecting the interests of the employees and securing advancements in their service conditions, but also has played a very significant role in protecting and strengthening the public sector insurance industry. It has contributed significantly for the growth of LIC and GIC which in turn has also contributed for the economic sovereignty of our country. Formed with a vision and dream for an egalitarian society, the history of AIIEA is a saga of struggle, sacrifice and success. The AIIEA has today emerged as one of the most respected trade union in the comity of unions not only in India but across the globe. The history of AIIEA is punctuated with various glorious struggles. AIIEA has always challenged the challenges and has defied all the odds and has emerged victorious in all its struggles. Today when we celebrate the formation day of AIIEA, we are also confronted with many a challenges. The attempts of the vested interest and the ruling class to weaken the public sector insurance and the attempt to increase the FDI limit and to privatize the public sector general insurance companies through Insurance Laws Amendment Bill 2008 is hanging like a Damocles Sword on us. Through our consistent struggle for the last two decades, we have defeated the attempts of the government to weaken the public sector insurance. However, we are confronting the International Finance Capital today. The government is under tremendous pressure from the foreign and indigenous capital to further open up the insurance sector. The growing Current Account Deficit (CAD) has become a matter of concern for the government. The falling exports, huge import bills, falling rupee value against dollar etc., are further adding to the concerns of the government. Added to these, the reverse outflow of capital (by FII’s) from our country has worsened the situation. The finance minister has openly stated that attempts will be made to attract Foreign Direct Investment in all sectors (including Insurance) so as to bridge the gap of the Current Account Deficit (CAD), poses a serious challenge before us. We need to be alert and continue our campaign and struggle to defeat the nefarious designs of the government. We need to draw enthusiasm and inspiration from the successes of our struggles so far and also the growing united struggles of the working class of our country, which is bound to put pressure on the government. Unity thy name is AIIEA. In its glorious 62 years of journey, AIIEA always stood rock solid as a unifying force to rally all sections of employees into struggles. The secret of its success story reflects in the slogan which we consciously give “UNITY IS OUR STRENGTH”. When we are celebrating the 63rd birth anniversary of AIIEA, the entire rank and file of our membership must take a pledge to nurture, protect and consolidate this unity that AIIEA achieved. For, there are attempts overt and covert by vested groups to disrupt the unity among employees for their ulterior motives. In fine, when we celebrate the formation day of AIIEA, let us take pledge to further strengthen the movement called AIIEA. Also let us remember on this day the sacrifices made by our senior comrades who built this organization brick by brick through their sweat and toil and rededicate ourselves to further the movement. Let us qualitatively and quantitatively strengthen AIIEA on all counts so that it becomes a powerful weapon through which both the individual and collective interests of the stakeholders in the industry are advanced and protected.